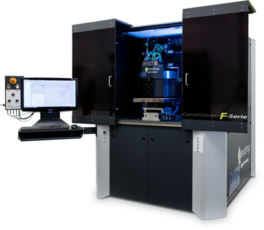 The CERADROP instrument is operating in the new MultiFab platform for the additive manufacturing of three-dimensional, high-resolution objects suitable for rapid prototyping, whose areas cover the, aerospace industries, aeronautics, electronics, optics or biomedical sectors. The objective of this platform is to set up a 3D printing additive manufacturing platform covering scales ranging from micrometer to macroscopic and in which multi-material can be implemented. This platform will be in very strong interaction with not only academic research, but also with the industrial sector; MultiFab is lean back to LAAS’s large micro and nanotechnologies platform, a member of Renatech network. – integration up to three online annealing modules as UV LED, near infrared and photonic. The equipment therefore gives the possibility of depositing various materials ranging from inks filled with nanoparticles to polymers or biological molecules. This is our field of application and our first achievements confirm that we have made the right choice. In addition, our inkjet experience with another manufacturer allowed us to say that the different software developed by CERADROP are the most advanced ones. To conclude, CERADROP teams (commercial, technical and training) were very attentive to our needs. We are very confident for the future because of the strong professionalism of CERADROP company.